There’s a new mood in bathroom design this AW18: precious metals become the new neutral, heralding a welcome return to grown-up glamour. From subtle accents to statement pieces, soft golds and gleaming silvers offer up an inviting glow. Drummonds’ brand new Ashburn bath (above) is a petite version of their classic freestanding roll top, making it perfect for small spaces, while going big on glamour. Based on 18th-century bateau baths, its classic double-ended design, period fittings and traditional ball-and-claw feet ensure it is every bit as grand as its full-size equivalents, but in a polished iron finish, this statement bath gleams with a contemporary aesthetic. 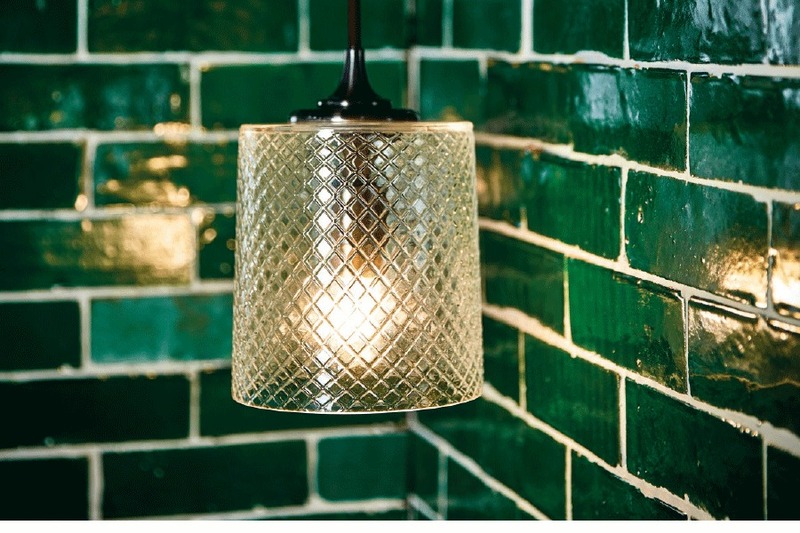 Also from Drummonds is a new range of handmade ceiling and wall lights that hark back to a golden age of understated elegance as bathroom lighting ups its glamour game. Part of Martin Brudnizki’s collection for the brand is the Deco-inspired Derwent flush ceiling light in brass (above); while delicate diamond cut-glass shades add sophisticated glitz to the antique nickel Dalby wall light. 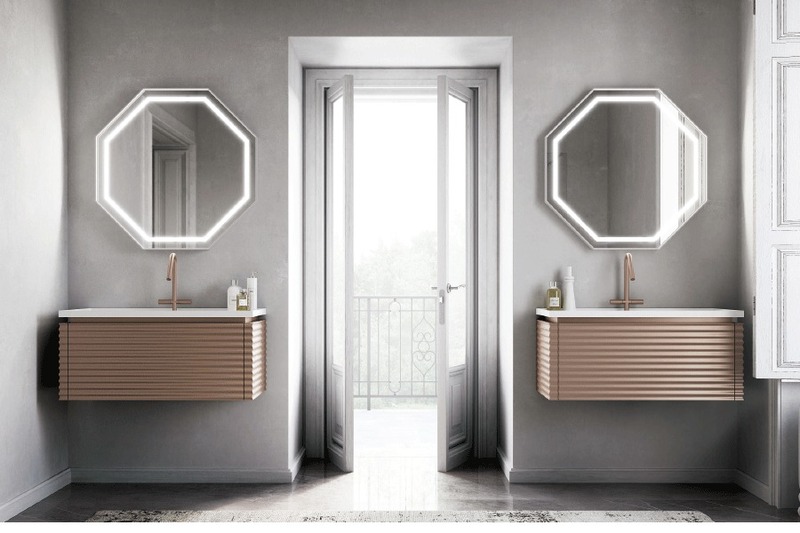 The new Dolcevita collection from Alternative Bathrooms (above) offers a softer side to the metallics trend with modular vanity units that feature a tactile corrugated design in a range of shiny finishes. Boasting new-generation metallic lacquers, the cabinets give subtle sophistication with a hint of Deco elegance. The collection also includes aluminium framed hexagonal mirrors with integrated lighting, mixing metals for modern glamour. 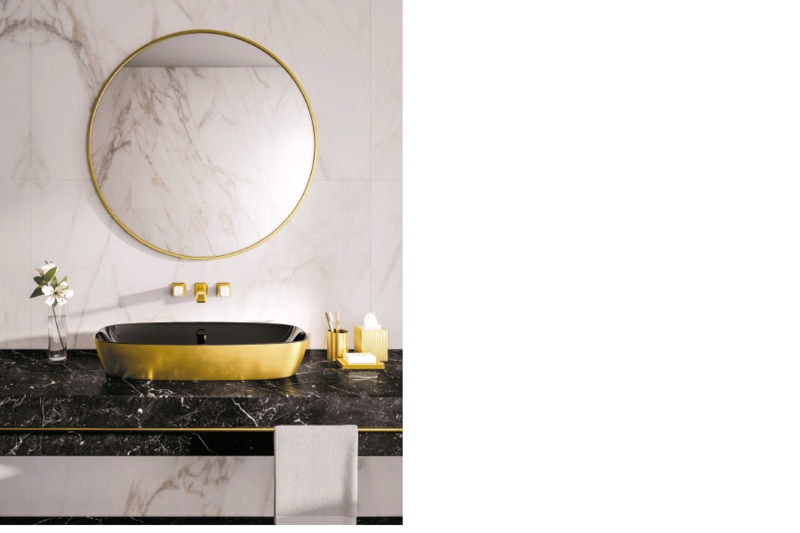 Boldly bringing house jewels into the bathroom, Italian brand Catalano’s new Gold & Silver range (above) swaps out white ceramic surfaces for the richest of metals, adorning basins, baths and WCs. Each piece is finished in a scratch-resistant titanium satin, giving a subtle sheen that’s more fine jewellery than glitzy costume. Offset with black or white ceramic accents, this high contrast keeps the collection contemporary. 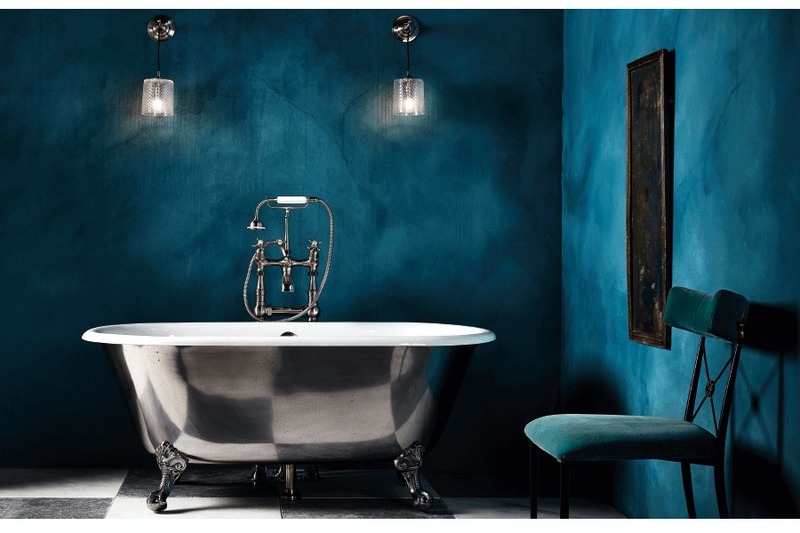 The new classic/contemporary bathroom furniture range from Ripples (bottom right) gets in on the gilded act, too, with handcrafted pieces inspired by the best boutique hotels. 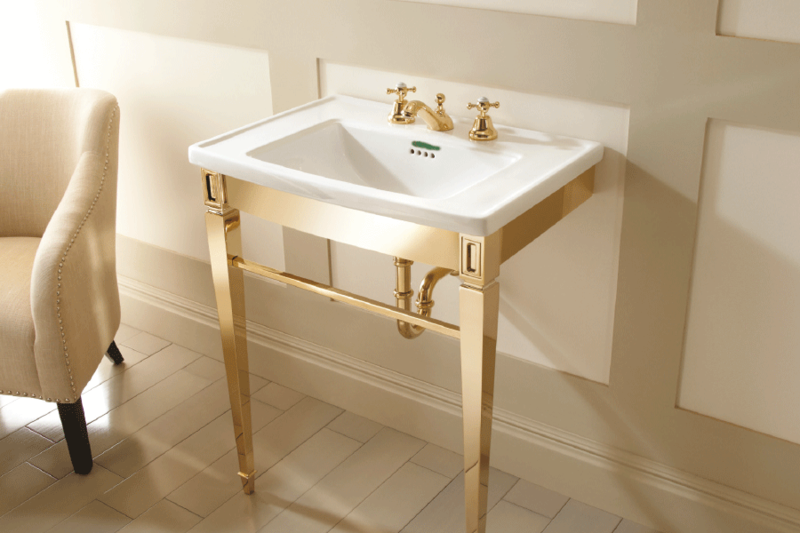 The Manvers collection – named after a prominent street in Bath – successfully marries vintage and contemporary styles with a clean-lined ceramic basin, Victorian-era style gold faucets, and a delicately ornate and finely tapered chrome stand in a soft gold finish. Recognising the move away from minimalist matte black and chrome finishes, and towards a new golden aesthetic, THG Paris offers a range of modern luxe fittings and faucets with timeless appeal. 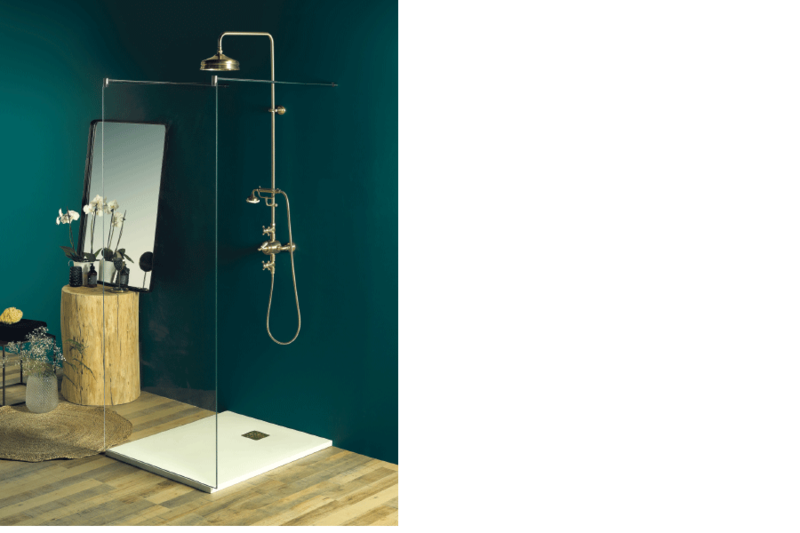 The Charleston shower (below) is traditional in design, yet in on-trend soft gold, sits beautifully in an otherwise contemporary bathroom setting: here, a simple glass box cubicle allows its decorative form to take centre stage.